Extermitech is locally owned and operated. We offer affordable pest and termite control for your home or business. We want you to know up front we are not just here to sell you a service. We will treat you and your home just as how we would want to be treated. We will not offer you a service you do not need and we will custom fit a service to meet your needs. We strive every day to make value meet quality. We love the staff and service!! Great company! We have been a client for over 10 years and have been satisfied with your performance and service. Jacob, our tech is always punctual and thorough. We are very satisfied with Extermitech's service. Jacob is professional, punctual, and very thorough when taking care of our home. Friendly staff and always works with my busy schedule!!!! Friendly punctual always sends me a reminder for annual checkup. Took off shoes in home. Inspected every exterior wall. Always prompt and never have to worry about whether they’re doing what you’re paying them to do. Extermitech is a company with much integrity! Service is prompt, thorough and they have helped us deal with specific unique pest problems. I have been a customer of Extermitech since 2004. They are great to work with and always professional. Ashley and Troy are awesome. They keep up with all my pest needs and make sure we close the new and existing homes on time for both of our real estate companies. Best pest control company ever. Ashley had my inspection scheduled and done within a few days, long before anyone else could get to it. We have had this company for a number of years, at our old residence and our new one. We have been at the new one almost 4 years. We are well pleased with their service! Extermitech office personnel are always friendly and helpful on the phone. The workers keep their appointments on schedule, and are friendly and professional when doing their work. Deborah. Zack has done a great job of getting rid of the bugs at the house! The one time we had an issue, it was brought to his attention and he came right back out and fixed the issue. Great company! 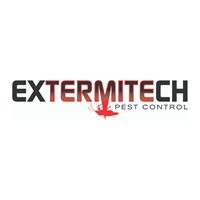 I have been using Extermitech Pest Control since 2002. Always happy with the service. Service always lives up to what they tell you and they stand behind their service. Very nice and professional. Highly recommend. Inspector is knowledgeable and always willing to answer my questions. The staff is very professional and customer oriented. Extermitech is the best. The customer service, the pricing and the effectiveness of their product is unsurpassed. I recommend Extermitech to everyone I can! Happy customer for years!!! Jacob is always punctual, if not a little early. He always takes his shoes off and is quick and efficient. And always very nice. Jacob is always very accommodating to our hectic work schedule. Everyone is extremely helpful and nice to work with. Show up on time; very efficient and courteous. Have been with extermitech for 16 years and have no complaints. They are dependable and trustworthy. I highly recommend them. Extermitech has been our first choice for termite protection since 2005. We have been very pleased and happy with the staff and service provided. Professional and great service company in Montgomery. We highly recommend them for any homeowners!!!! You have done a good job the year that I have been in my home. I do need to have a wood inspection report done on my home. I have a closing date of May 31, 2018. Please call me at 843-291-2679 this is Stanley Bobo. thanks. Have used you for almost 10 years and very pleased with customer service and appointment reminders as well as with the actual pest control service. I have termite service with Extermitech. Their technicians are always friendly and professional. I like the liquid barrier system better than stations as it is less intrusive. Always on-time and courteous service.